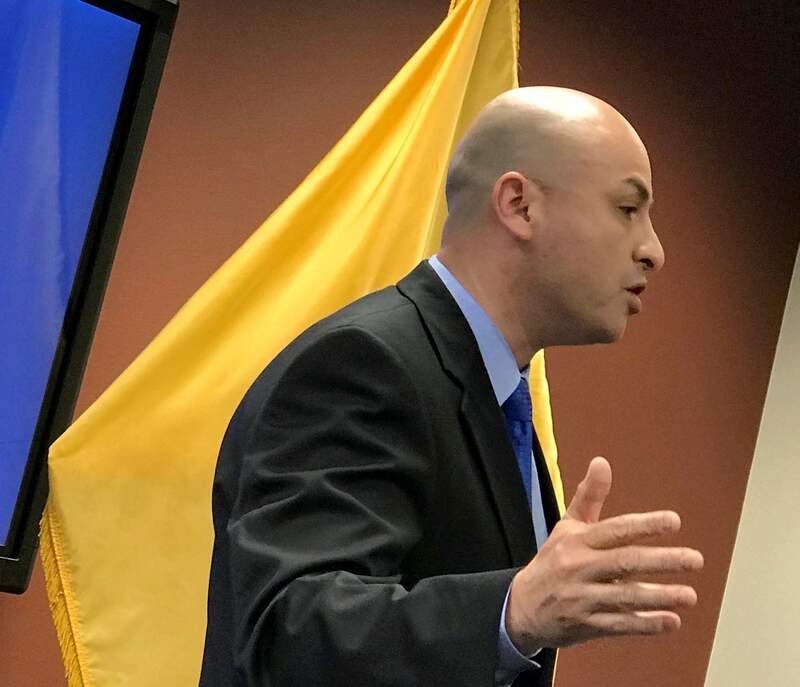 New Mexico Attorney General Hector Balderas speaks at a news conference regarding the University of New Mexico athletics in Albuquerque, N.M. New Mexico’s attorney general is slamming the state’s largest university over “flagrant abuse” of the state’s transparency laws. ALBUQUERQUE – New Mexico’s largest university flagrantly abused the state’s transparency laws while school officials asked employees to delete emails and text messages relating to athletics, the state attorney general’s office said. In a report released Thursday, the attorney general’s office said the University of New Mexico sought to actively hide information from journalists seeking information about questionable spending by the athletics department and the contentious decision to cut some sports. Assistant Attorney General Dylan K. Lange wrote in the report that the numerous violations centered on the state’s Open Meetings Act and the Inspection of Public Records Act. “Since 2015, UNM has established a pattern and practice of neglecting their responsibility to allow access to public information and access to meaningful discourse and deliberation on public business, which are fundamental rights afforded to citizens of New Mexico,” Lange wrote. He said it is clear that the university lacks proper written internal controls to ensure proper and complete compliance with the Inspection of Public Records Act. According to the report, there were specific instances regarding a lack of transparency including emails from former Athletic Director Paul Krebs. In some emails, Krebs appeared to direct employees to destroy emails and documents related to a 2015 Scotland golf trip fundraiser where the university used around $25,000 in public money to cover private donors’ expenses. Krebs even instructed his wife Marjori Krebs, a university employee, to delete emails, the report said. In another email, Krebs acknowledged misleading the media over the Scotland trip controversy and complained about “spies from within” giving information to reporters and bloggers. Those emails from Paul Krebs weren’t released to reporters requesting documents through the state’s open record laws because the university allowed Krebs’ personal attorney to remove some the emails, the report said. University of New Mexico spokesman Daniel Jiron said the university’s legal team was reviewing the report. Krebs, who became the athletic director in 2006 and retired last year, has said the Scotland trip was meant to strengthen relationships with donors. “The public and our fans put their trust in us, and the only way to keep that trust is to admit when an error is made, to rectify it, and to make sure that it doesn’t happen again,” Krebs in a statement at the time. Neither Paul nor Marjori Krebs immediately returned an email from The Associated Press. The report comes after the university’s regents voted for a second time to eliminate men’s soccer, men’s and women’s skiing and women’s beach volleyball. Board members had to vote again following complaints that the initial vote violated open meetings laws. New Mexico’s Attorney General Hector Balderas has not concluded the ongoing criminal investigation into the university’s questionable spending. State prosecutors are looking at whether there were possible violations of conduct laws and the anti-donation clause in the state Constitution.